I like to think that I have quite a bit of self-control and the ability to delay gratification – I bet I would have aced the marshmallow test! So when I see the term “impulse purchase” I think that it can’t apply to my spending habits. I mean, I don’t add candy at the grocery store checkout aisle, and what else could an impulse purchase be? The more I thought about that question, the less I was able to pin down an answer. 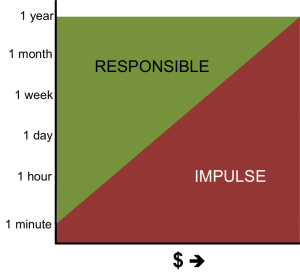 At first I though “impulse” would be defined by the amount of time between first considering and making the purchase, but now I think there are several factors at play. For example, which of these scenarios do you think is an impulse purchase? I think that the chief determinant of whether or not something is an impulse purchase is the ratio of the price to the time spent considering the purchase. A day spent considering a purchase could be non-impulse/responsible when the price is small but impulse when the price is large. This reminded me of Barney’s Hot-Crazy Scale from How I Met Your Mother. HIMYM Special – The Hot/Crazy Scale [3.05] from pride on Vimeo. Of course there is some influence of income or discretionary spending on exactly where this line is for you – purchasing an eReader might be responsible with only a few minutes of consideration for someone with a high income, whereas we deliberated for a couple days on it even when we were getting it for “free”. How about these questions regarding impulsivity? Is it less of an impulse if it’s a great deal? Is it a ‘want’ or a ‘need’? Did you have to use debt? Does writing it down matter? Did you check with your spouse? Is the item consumable or something you will live with for some time? Have you considered the opportunity cost? So I wasn’t able to come up with a definitive answer, but I probably won’t be throwing the term “impulse purchase” around anytime soon since it turns out to be so complicated (to me). And I’m less confident in my imperviousness to impulsivity. How do you define an impulse purchase? What do you think about the factors I proposed? Are You a Tightwad, a Spendthrift, or Unconflicted? 45 Responses to "What’s an Impulse Purchase?" I think time is a definite factor but that isn’t the only or even main factor in some cases. Thanks for the mention of our townhouse purchase on a whim. I say it was on a whim because we made the decision quickly, or within a week or two if I remember right. Some may call that an impulse purchase of a home but we made sure to consider all of the factors before buying a house because if you don’t you’ll be in trouble a year or two down the road. For us, what made the townhouse such a great deal was the oh so low house payment and the fact that we knew we could rent it out for a profit when we were ready to move on. Kyle and I are TERRIFIED of the home-buying process because you do have to act quickly in many markets and that is antithetical to our personalities generally, not just in finances. But I think even if you are required to make a decision quickly on a particular property, it is possible to do the legwork in the weeks/months/years as you anticipate buying that will make an ultimate purchase non-impulse time-wise. Is the price axis also in the log scale? First, I agree with the idea that the time spent considering a purchase versus the dollar amount is the right way to frame it. However, in some cases the time is spent a long before the purchase and may be not be directly linked to the purchase. This can give the illusion of an impulse purchase when it is not. Some people become experts at the valuation of certain items through schooling, employment, or even hobbies. In these cases, the purchase decision for a particular item may take seconds, but the training to be able to do that might have taken years. Second, I’ve found that you can actually budget for impulse purchases if you want to do that. Like anything else, if you can quantify it, you can budget for it, so if you pick a (reasonable) overall dollar amount and stick to it, you can still make impulse puchases, in the sense that you don’t know what, when, or where you might purchase things. A lot of people seem to have a small “fun money” or “not categorized” pot of money that is essentially used for impulse purchases. I agree, if you have become a valuation expert in some area the decision to buy could be quite fast – but I think the question is if they were shopping for that item or not when they saw the good deal. Hm, I don’t know if our budget incorporates impulse purchases. If it gets to the end of the month and we haven’t used our eating-out budget yet, I suppose we might go out to dinner for no reason, and that would be relatively impulsive for us. Not sure what other budget category that’s possible for aside from groceries, which is more of a need/want. That always upset me too that Barney miss charted her! If you are going to chart a phenomenon, at least be consistent! It would have been so great and easy for them to get it right since it should have been only vertical and horizontal lines! It hadn’t occurred to me to use marshmallows as incentives – actually I don’t care for them much – but it makes sense! I give myself other little rewards when there are tasks I find distasteful. I think whether something is an impulse purchase depends on whether it fits into your spending plan, or you are altering the plan to fit it. So, for instance, I could buy a plane ticket to visit family in the Midwest today, but it wouldn’t be an impulse purchase because I’ve had that trip in mind for sometime this spring for many months. Making a sudden decision about something you’ve been planning for a while, like buying a car or house, is not necessarily an impulse buy if your decision matches your plan. On the other hand, when I go to the grocery school with a specific list and wind up buying extra stuff because it’s on sale, that’s impulse buying. It’s not necessarily bad though, and judging that would be based on a price/budget related scale. Grocery impulse buying is usually ok or even good, since noticing sales is how I stock up on canned goods or decide on some fresh vegetables to get, so I try to keep a little room for it in the grocery budget. Impulse buying new clothes or shoes probably has more of an impact, so that’s the level I would try to avoid. Impulse buying a major purchase for your home or car is…something I don’t even understand. Yes, that is a good point about whether there was a plan in place. But for how long does the plan need to be in place before the purchase becomes responsible? I think the same time/$ framework can apply. Impulse buying will almost certainly only happen if you put yourself in a window-shopping position – that’s why I don’t go to the mall unless I have an item in mind to buy because I will definitely impulse-buy clothes. I tend to think of impulse purchases as being those along the lines of picking up something at the last minute in the checkout aisle at the grocery store. I just did that a week ago, actually buying a DVD as I was about to check out and pay. Now, I hadn’t bought a DVD for myself in years. I see it as old technology. But, I bought on right there on the spur of the moment, $5 gone! In terms of bigger purchases like a home, it’s hard for me to wrap my head around that being an impulse purchase, but that could be due to my own risk aversion with bigger purchases. I guess my point here is just that maybe there is a sliding scale for judging impulse purchases! I think it tends to depend on the personal situation, though I think time is pretty uniform across most of them. It’s not perfect though as some decisions just simply do not take that much time. The danger I see is rationalizing the decision in order to convince ourselves in was a necessary purchase. We all do that to some degree, but the key is to be aware of that. I wonder if rationalization is more with less or more time spent considering… I think if I spend a little time I can rationalize but the longer I think about it the thinner the rationalization becomes to me. But I bet others are the opposite. One way to avoid impulse buying is to always have a list when you shop. I never use shopping as a recreational sport which helps too. Haha, shopping as a recreational sport – me neither! But my husband does – with online reviews of electronics! I am not sure time taken to make a decision correlates with impulse spending all the time. For example, if I have a list of wants and needs already made and a house just pops up that happens to have everything I want and more, for a reasonable price, I don’t see a point in waiting for just waiting sake. I would buy the house immediately (or however long it takes to go through the process). Same thing with any other stuff. We bought our ipad mini with 10 mins of research. We already knew what we wanted in an ereader, nothing worked well until ipad mini came along. Personally, I define impulse purchases as something that until the point I lay my eyes on it I don’t even realize I need it, but if I see if I somehow feel I can’t live without it and buy it without thinking the “need for the object”. So yes, time is involved, but more than time I think it my need for the object that defines my impulse purchases. I hope I made some sense. Suba recently posted..De-cluttering your house: How to let go of stuff? Yes, I think that is a good criteria – didn’t know you “needed” it until you saw it. I agree that with large purchases what makes it not impulsive is that you have considered and planned for the purchase for a long time, not that you acted slowly when confronted with a particular version of the purchase. I’d agree with Suba. Where there is a grey area is the time spent deciding to purchase a kind of item, like a house, car, or ereader, vs the time spent deciding to purchase a specific item. The last time I bought a car from a stranger, I was handing the guy the cash within 24 hours of seeing the ad in the paper. I was already in the market; years of experience and my budget narrowed down my choices to only a few vehicles. When I saw one that matched what I was looking for, I took it for a test drive to make sure it was sound, made an offer, and got the money out of the bank. I owned that car for 8 years before I crashed it, put over 100,000 miles on it, and drove it for 2 years before it needed anything more than routine maintenance. I similarly acted quickly when I bought my car – I had been trolling craiglist for several months for a certain model at a certain price range and I knew I had to jump when I saw it! I hope I get to +100,000 miles on my car like you did – only about +20-30k as of now. Well I think I had a couple of those this week (note: I didn’t cave to any of it). On Saturday I REALLY wanted to get a facial. I justified it with the fact that feeling shiny and new would give me a much needed pick me up. Tonight I wanted to order out because I’m so sick of the boring food I have at home. But I thought about it a little and planned ahead what client checks are coming in…rent coming up, and I wanted to feel less stressed about that, so I didn’t. So many financial ledges this week! Good for you for holding out, especially because your method was to think about the opportunity cost (peace of mind)! House buying is definitely somewhat impulsive since you have so little time to react. That is so hard because I’m not an impulsive buyer much. With all the little things that I want to do around the condo, I’ve been keeping a list, prioritizing the items, and thinking about each one for awhile, which has really helped with the Buying All The Things mentality. I definitely impulse spend a bit, but I think I keep it mostly in control and not on super big things, or at least I keep the fixed stuff down enough that it’s not a budget breaker if I impulse spend a bit. My smartphone was definitely a bit of an impulse purchase a few years ago though… I’m so glad I’ve got the monthly plan back down to $20-40/month instead of the $85 I was paying before. One of the good/bad things about high income is that I can afford pretty much anything I want out of my regular cash flow (since I have ~$2k/month in free cash flow). That makes it super easy to impulse spend. Do I really need to save up for 5 months to buy a new cell phone? No, but I should just to make myself think about it for a few months. I can see how that would be a blessing/curse. When spending isn’t a big financial strain you really have to put more systems in place to make sure you’re not making other kinds of mistakes (clutter, waste, opportunity cost). That’s a good idea about listing what you want done around the condo to pace the upgrades. I bet it will take us a while to get out of the “renter” mindset – we never even want to change anything about our abodes. That’s a great monthly price for a smartphone! What did you do to bring the bill down? Yup, my tax refund is “just” going against the mortgage. I find that exciting, haha. Hm, good deal. What is a “medium” user? I’m probably low but Kyle might be medium. They’re great for sharing too! It’s $6/device and you can pool minutes on the same account. I’m a “medium” user in that I use 200-600 text messages, 300-1,200 minutes, and < 100 MB in data each month. Low+medium user would actually be a perfect combination! They're also no contract. Plus their website shows you your usage so far this month and estimates what your bill will be and they will credit/charge you if you go under/over what you "predicted" you would! So if you have a low month while you're out of the country, you'll pay less. If you have a high month while you're traveling for work, you'll pay more. This is great because I only really need a data plan while I'm traveling for work, so I don't have to pay for it on the other months. I used to be the queen of impulse purchases, and I think it had a lot to do with the time involved in decision making–the quicker I chose to buy things, the more that I bought. It was a vicious cycle that I’m very happy to have broken. I’m glad you identified one of the factors that can reduce impulse buying for you!